Is the Education system helping us innovate or are we simply preparing the students to do assembly line work? The more we put in place uniform systems, curriculum and structure, our education will deliver less innovation and design. When you give a block of wood, with two basic tools like a mallet and a chisel to a young person, you will make the person think design and evolve. If you give Lego blocks, a kit to assemble an aero-model or simply use templates, you will stifle design and creativity. The kits and uniform building blocks are good business sense for marketeers, less effort for teachers and easily help build prefab models which are misinterpreted as creation in our education system. When children are given a container full of play dough or our good old plasticine, they make shapes and put thought to action. If you provide moulds/ templates with the play dough you will make them use the shape and create a mere cast! Design is an evolution of vision and free thought, from chaos to order, from fuzzy logic to logic. The essence is freedom and the evolution of the mind. 'Jugaad' our frugal and flexible approach to innovation has been the true spirit of an Indian. Innovation helps us do more with less, generates original ideas and pioneers growth. It all begins with the honest and true action guided by a free spirit of the young mind. Frugality, flexibility, and following your instincts are principles we all learned growing up in India. Intuition and immense adversity are the mother of best ideas. In the west innovation is done in R&D departments, in India innovation happens at every corner of the street. As educators and trainers it is our duty to provide an environment that helps a 'free mind' to design and this is perhaps the only way to bring about innovation. The assembly line method of manufacturing built by Ford was indeed a way to mass produce with standards and in good time, today we have China as the factory of the world. Israel the famous 'Start-Up Nation' and has the maximum number of new enterprises listed on the Wall Street. Silicon Valley the mecca of innovation finds a large part of the design and innovation originating from Israel. To 'process and build' is indeed good business but to 'design and innovate' is much bigger value. If we do a 'me too' and look at our competition we waste opportunity, if we reflect and think we will create, this is truly what education must help us to do. We do not need a replica always, there is a limit to what we can do with an assembly line, and the way the people of Japan and Israel today look at innovation and design, there is a lot in it for our educators to learn. 'Charkha' was believed to be a symbol of self sufficiency during India's freedom movement, where each household was self sufficient and innovated to build the nation. We will he happy if innovation is able to solve some of the daily problems faced by us. 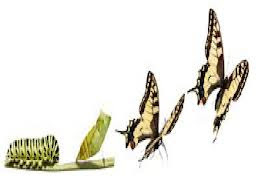 Given the caterpillar, it is hard to believe that one day the butterfly will fly free! Innovation and design alone can make the mind soar and conquer new frontiers. "Indian companies will find it very difficult to truly build a global brand till they invest in technology like Samsung and LG. Indian spend on R&D is about 0.9% of GDP. This compares with China at 1.5% of GDP which in absolute terms is second to the US! South Korea spends about 3.4% of GDP, Japan about 3.5% of GDP, and the US about 2.8% of GDP. It almost appears that you need to spend about 3% of GDP to be world class leader in technological innovation." ~ Kamini Banga of The Economic Times. What does 'Made in India' stand for? This is a very hard question and we need to ponder over this. Are we just the suppliers of 'low end' unskilled labour force or 'high quality' managers and talent to the world? If we want to lead the world and regain our lost glory our education system and policy must encourage innovation and learning, not just focus on literacy statistics. Next time when we go to a class full of innovative minds we should make it our duty to help them think design and innovate. Art and craft has been the intrinsic part of the Indian civilisation, yet we have not realised the true potential of innovation and design. The history of India shows our crafts people were the leaders in design, the Taj Mahal, the famous forts and monuments that stand out in the world are all designed by the creative Indian. Arayabhatta, Tagore, Raman, Chanakya...many leading minds and even a legend like Mahatma Gandhi were real innovators in their areas. Today we are becoming an assembly line of Japanese design, a producer of crops grown from imported seeds and sending out the best of Indian mind to empower nations all over the world. A teacher alone can help build a great India by helping the young people lead in innovation and design. Let us not ape competition, but be original as this alone will add the greatest value and who knows the block of wood a teacher gives to the student, will one day produce another marvel in design. The true 'Guru' today needs to be resurrected in our society and help the 'Shishya' reach his true potential. Innovation and design will only be possible when the teacher finds the rightful place in society and is able to be the true leader the society needs. Time is now ripe for us to value our culture, develop an open learning environment and recommit ourselves to innovation and design. Gone are the days when we could pride ourselves with providing the world with engineers and doctors and do the low end process delivery. We have to reclaim our true position as leaders and innovate to succeed.